I thought I would get a little more creative with quilting my Regatta Quilt. I wanted to, but common sense and laziness won out! 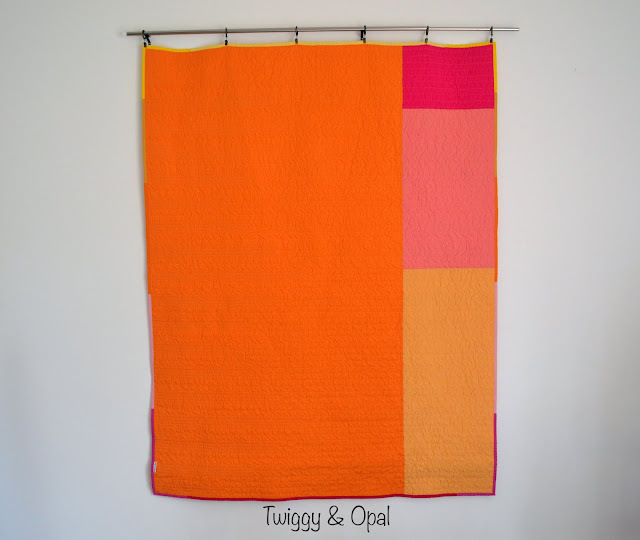 There are some quilts that require a bit more finesse and detail, and there are quilts that need simplicity and a quick fix. Straight line quilting is something I can do. Fancy free motion quilting on a big quilt, not so much! There is also a time when we just want to finish a quilt either because we are excited about it or we are tired of it! In this case it was because I was excited to get this one finished. It turns out I love this color combination and I couldn't wait to have it done. The best way for that to happen...simple quilting! The neutral stripes and the long solid stripes received a line down the center. How much more simple could it be?! I then decided to add more lines in the short solid stripes for more definition or pizazz! I like how it ended up. Gotta love this pile! I want to fall into it and melt from the warmth the colors are radiating! Because I choose to go simple with the quilting, I decided I'd piece together a binding that matches the like color sections. It was really fun to add this detail and made all the difference to the vibe of the quilt. I didn't just end with the 'extras' on the binding! I decided to go forth and piece the back. I'm determined this will be the year I work through my stash with a vengeance! Making pieced backings is one way to do that quickly! This quilt uses jelly roll strips and if you are like me, you have jelly rolls that are laying around and you haven't a clue what to do with them. I don't think you would be disappointed if you were to use those strips in this design...at all! The best part, it's an easy make and the pattern is FREE! The Regatta quilt was designed by Daniela @Block M Quilts. You can find the PDF at the bottom of the page here: Regatta Quilt. 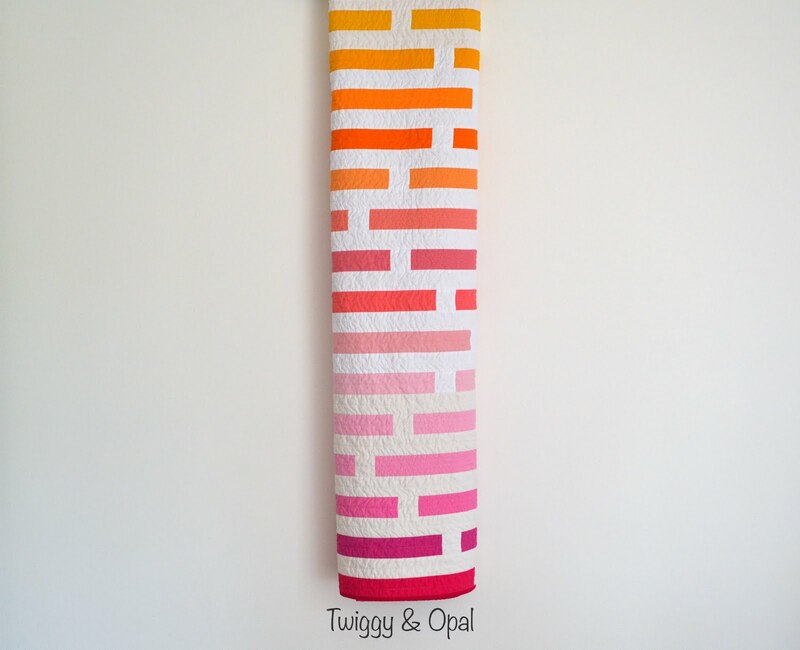 Do you make cobbled together backings for your quilts? Do you have a method when you are planning it? I haven't quilted the 'bonus' quilt I made from the left over Regatta pieces...but it's pinned and ready! Stay tuned on that front! 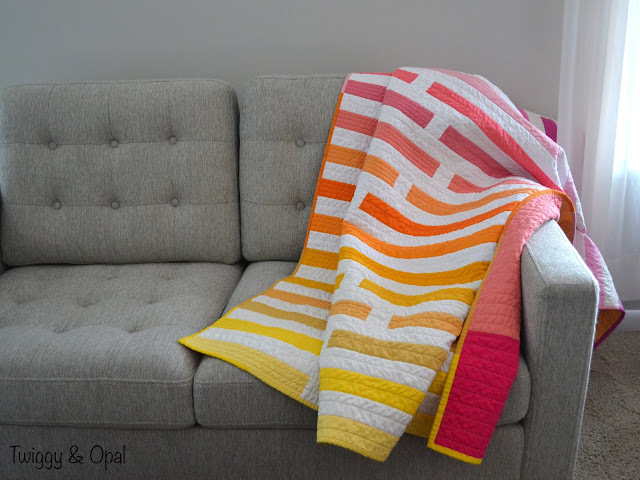 This is a wonderful quilt, I can see why you wanted the quick finish! I also think the straight lines nicely emphasize the clean lines of the design, much like a ship. I think the straight lines were the best way to go and I ended up liking them very much. 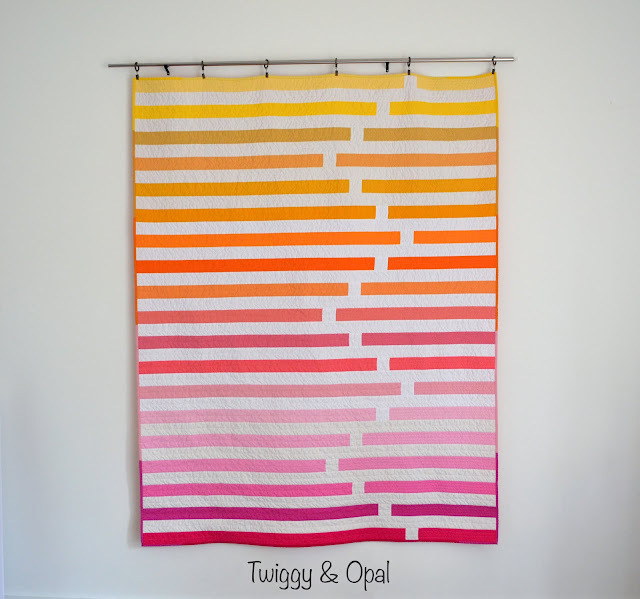 And the design…fun quilt to make! 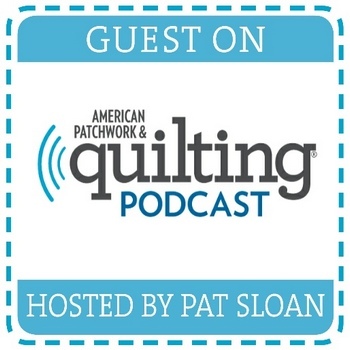 I agree that some quilts call to have custom quilting and some call for straight lines. Congratulations on your finish! I love it - the simplicity, the color palette, the quilting, everything! 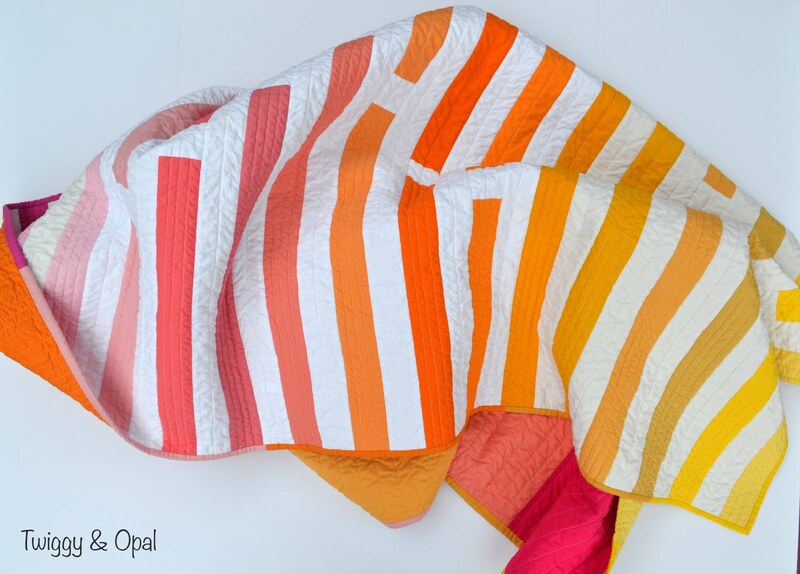 You know, some quilts just WANT to be quilted simply. If you had spent all the time and effort doing something fancy all over this one, I think it would have detracted from the elegant, graphic simplicity of the design. It's perfect just the way you did it! The colors are fantastic. The quilting wonderful. All around beautiful. Swoon-worthy colors, pieced backing, and that binding... you turned simple into stellar. Such a bright and fun quilt!! I agree that is seems to exude warmth and happiness too!!! Beautiful finish, Jayne! I love the Creamsicle colors, like a burst of summertime. 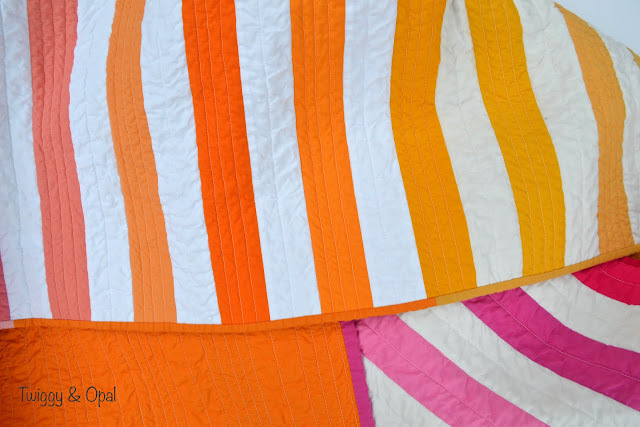 The simple straight line quilting is perfect for those bold, yet simple stripes. Congrats on the finish! Beautiful quilt! I'm about to tackle a yet to be determined quilt pattern with my stash. Need to use it! It's a gorgeous palette Jayne ! The simple quilting design is perfect and I love the binding and backing too ! Absolutely LOVE this Jayne! I really like that quilt, period, too, but just cannot fit in one more thing right now, but you can bet I've downloaded the pattern! I also really like the way you quilted it; oh yes, I know that feeling when it's just get it done because I'm excited and want to be using it! Thanks for linking up with TGIFF! Sometimes you need those relaxing easy quilting projects, it does not mean the quilt would look any less beautiful. This one is a perfect example. The straight line quilting echoing the stripes is perfect. It's a lovely finish, Jayne! I love the straight line quilting you did on this one, Jayne! It really fits the design and lets all that beautiful color stand out. It's a beautiful finish! Great finish! I really like the simple straight line quilting. 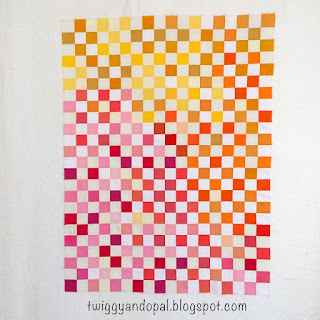 It gives a great texture without taking away from the wonderful bright colors of the quilt. The straight-line quilting was definitely the right decision. It is gorgeous. I'm not sure this pattern made with just any jelly roll would ever be as pretty as this one, though. What a beautiful creation! Congratulations on the finish. What a bright and shiny quilt. Especially against the white and snowy background. Pieced backings are such a great way to use up all the extras. It does feel good to put the stash to work for you. Great finish Jayne. The simplistic quilting matched the piecing design perfectly. Such great summer colors! The quilting looks great. Sometimes simple is what is needed. I had to laugh when you said common sense in the first paragraph. With all the love I can muster, I sometimes doubt your common sense (and sanity) because of all the tiny, tiny piecing you do. LOL But it all looks so beautiful. 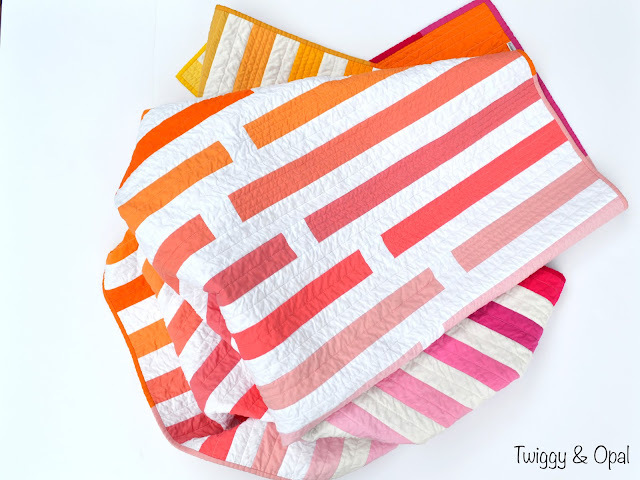 Love your colors for the Regatta quilt! It speaks sunshine and warmth! The bonus quilt is great too! I'm leaning on using my leftovers for a pieced back. My goodness, this is sweet! This is a beautiful finish. I just love the colors and keeping the quilting simple just allow the quilt to shine and really accentuate the movement of it.